As a trip that can be a little more challenging, being prepared with the right expectations beforehand can make all the difference once you’re on tour. 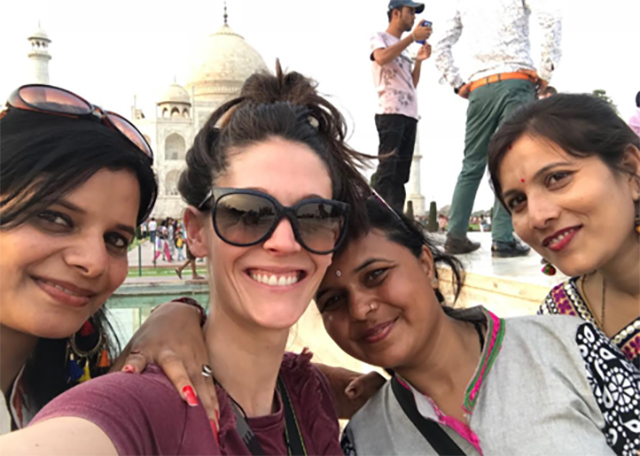 Here are a few of Rebecca’s top takeaways from traveling through the Golden Triangle on our tour, India: Delhi, Agra & Jaipur. Whether it’s your main suitcase or the day pack you’ll carry with you onto the bus, having the right things will make your trip a lot easier. In Indian culture, fashion is much more conservative than what we’re used to at home, and at many of the main sites we visited shoulders and legs need to be covered. I wore loose, flowy pants with a t-shirt or sleeveless shirt and scarf combo and was able to stay comfortable in both the dry heat and our surroundings. Choosing the right stuff to put in your day bag is just as important! Some of the necessities I kept in mine? A camera, scarf, extra socks, hand sanitizer, tissues, wipes, water, my journal, and a pair of sunglasses. Though we might not think we’re very exotic as westerners, to Indian locals we are—especially to domestic tourists traveling to bigger cities from rural villages. For some, you may be the first westerner they’ve seen in person, which is why you could be asked to get in on a selfie. I’m not suggesting that you have to say yes if having your picture taken makes you feel uncomfortable, but understanding the photo-taker’s perspective can help make the interaction a positive one. As a predominately vegetarian country, the food in India stands out from other Asian cuisines because of its limited use of meat. This doesn’t mean you can’t find any meat dishes here at all: “non-vegetarian” options were available everywhere we went. One thing that I was most surprised to find out was that “chai tea” in India is just regular tea! To get a chai like the kind we’re used to here at home, you have to ask for a “masala chai”, which means “tea with spices” in English. And if you’re thinking about trying any street food, proceed at your own risk! This isn’t Thailand where bites from vendors are generally safe enough for us to eat. ATMs are few and far between in India, so it’s better to bring dollars with you to exchange on arrival instead of relying on your debit card to withdraw local currency throughout the trip. In addition to the standard gratuity for your Tour Director and bus driver, there are generally more opportunities for tipping on this tour than most. Some of these instances include at public bathrooms, for your 4×4 Jeep and rickshaw drivers, as well as for the bus driver’s assistant. Be sure to break your larger bills at places that are more likely to have change on hand, like your hotel or bigger restaurants. This way, you’ll have smaller bills ready to go for the Jaipur Market. Been to India before and have tips you’d add to the list? Let us know in the comments!